There was a time when the only matte liquid lip under £20 was the NYX soft matte lip creams, and although they stayed cult for a while it wasn’t long until the other drugstore brands followed with their own formulas. It seemed everyone had jumped on the bandwagon, except possibly everyone’s favourite drugstore brand, Rimmel. That was until now. Rimmel answered our prayers, everyones favourite stay matte range now has lipsticks, liquid lipsticks in fact and *spoiler alert* they’re really good. There’s 15 shades available, right through from the everyday nudes to deep purples, signature reds and even a black – who needs a Kylie lip kit? Even though these are a liquid lipstick they aren’t what i would call a “true” liquid lip, they’re definitely a creamier thicker formula but that isn’t a bad thing. Sometimes classic runny liquid lip formulas can be very drying, so i do prefer a creamy formula like this a lot of the time. 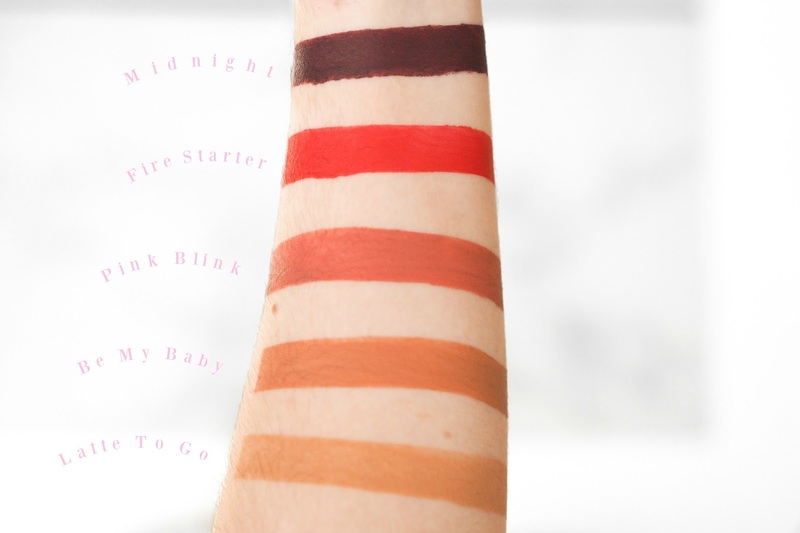 These are a cream formula, so you aren’t going to get that shocking opaque pigment immediately like you would with a thiner formula, but the pigment on these is good especially for the price. Some shades are better than others when it comes to getting even application, but it really isn’t difficult to apply these and reach an opaque finish in a few seconds and that applies to all colours – some just require a tiny bit more product. I am pretty surprised to say i don’t find these drying in the slightest, but they’re incredibly long lasting. I (wrongly) assumed that because these were more of a cream formula they wouldn’t be long lasting, but i was so wrong. The first time i wore one of these i got home and thought the lipstick wasn’t actually still on my lips, but when i looked in the mirror i found the colour was pretty much still intact. It did need topping up in the usual areas like right in the centre of my lips but everywhere else was completely fine. Eating with these on does mean you’ll have to top them up, but for a drugstore lipstick they’re incredibly long lasting and comfortable on the lips. I’ve found myself reaching for them more and more, and i don’t have to sacrifice dry lips for comfort any longer. Also they smell a bit like a Christmas candle, what’s not to like? Shop the new liquid lips at Boots here. Disclaimer: This post contains PR samples and affiliate links. I love cream formula liquid lipsticks, these sound really good! I've seen these popping up on Instagram but this is the first review I have read on them. These sound incredible and like something I definitely need to check out, I can't believe you couldn't feel it but it was still in tact! I'm so excited about this range, I absolutely love matte lip products. Pink Blink looks like the shade I will try first! Love the red! Need to gives this a try! They all look amazing! I was in a French supermarket where Rimmel is sold a few days ago (I live in France ^^) and I was actually thinking "Why don't they release any liquid matte lippies ?!" – wow. Prayers answered. The dark one actually looks really good and I'll need to check if they've got any more cool-toned lippies – oranges aren't really my thing. Thanks for this amazing review !